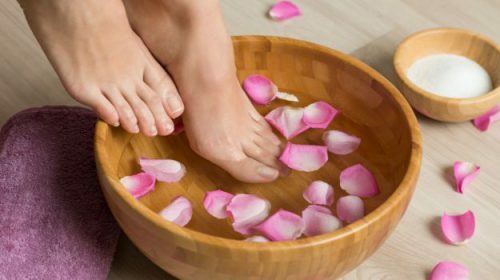 Giving your feet a mini-massage will relax your feet and reduce swelling. Everyone knows that cute shoes aren’t always the comfiest pairs in your closet, but that shouldn’t stop you from flaunting your fashion sense on your feet. Lately, tons of fashion runways, streets and celebrity-packed events have been teeming with ladies who are sporting bare toenails. As the warm summer weather continues, it’s the perfect time to wear your newest pair of sandals, whether they are casual flip flops or gladiator-style platforms. However, before you don a pair of shoes that shows your toes, make sure your feet are well-groomed and ready to be seen.